Our Landfill Tax grant funded project over in Morley Green is nearing completion this week. WREN funded some major drainage works plus the stoning of around 1km of footpath in drastic need of a revamp. After starting the job in torrential rain, the weather has now turned for the better and it’s now possible to use the footpath without wearing wellies! For most of the year our herd of Longhorn Cattle can be seen conservation grazing various grasslands within the Bollin Valley. But where do they go in Winter? 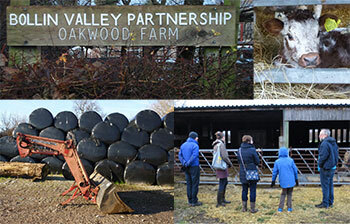 Twenty Two people booked up for the farm tour and a chance to see the cattle in their Winter digs at Oakwood Farm in Styal. 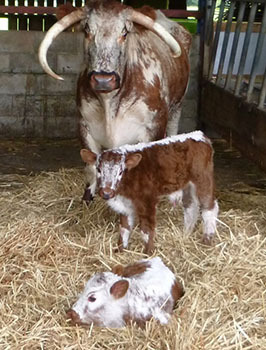 Star of the visit was newly born calf Bollin Rainbow (seen in the photo to the left). Making up stile kits at Styal Workshop. 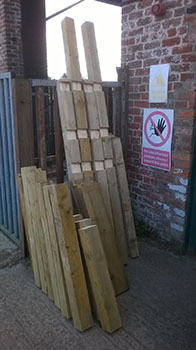 As a Ranger things begin to feel autumnal when you start making up stile kits as it marks the end of the summer season of cutting back vegetation and the start of winter works of replacing old footpath furniture. These particular stiles have been made for the Timperley area to replaced damaged ones. 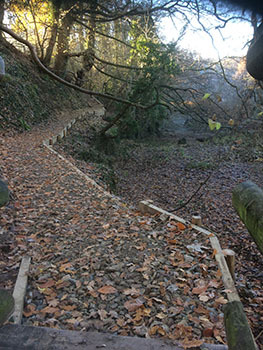 There are also additional steps to improve accessibility at a number of stiles. 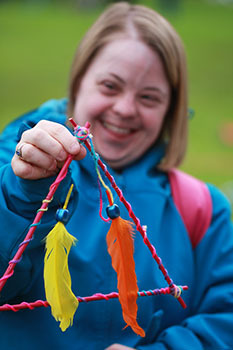 An afternoon of crafty fun was had by all on this afternoon event at Newgate Nature Reserve. 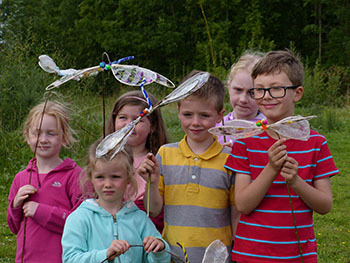 We made and decorated willow dragonflies, and put our selves in the mind of different wild animals building them mini homes from materials scavenged around the Nature reserve. Twin Calves are a rare event, this is only the fourth pair of twins born in our herd. Providing milk for two hungry calves can place quite a strain on Mum so the rangers are helping Bollin Longhorn Kate out by supplementing her milk with powdered calf milk. At six weeks old we will be able to stop bottle feeding and let Kate carry on on her own. Poor weather in the week leading up to this event may have put some visitors off but fortunately the weather on the day was great. All those that came had a great time, and Bollin Valley Partnership would like to thank the many volunteers that make this event possible. Tythy Tidy / Spring Clean for the Queen! 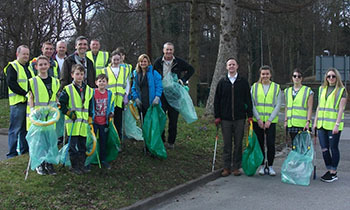 Around 20 volunteers turned up to give the Middlewood way and the Bollin Valley a spruce up as part of the National Campaign to ‘Clean for the Queen’ in time for Her 90th Birthday in April. 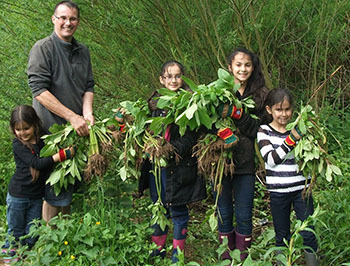 This year we had help from local scouts who found a scooter, an owl box and lots and lots of roof tiles. We had refreshments provided by Costa, who also sent volunteers from the Macclesfield branch. 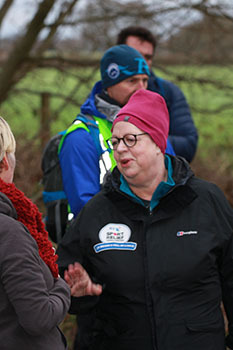 As part of this year’s Comic Relief, Jo Brand has been walking from Hull to Liverpool. She was joined on the penultimate day of her seven day 150 mile challenge walk by Bill Bailey. The route took them along the Lymm Railway Line, a site managed by the Bollin Valley Partnership.